Hello, and welcome to Gospelman! This is the comic strip version of the series, which is a gag-a-day. It's intended for Christian readers, but I hope everyone enjoys it! My name is Will Boyer and you'll get to know more about me later. Along with being a Christian, I'm the creator of, one of the writers and the artist on Gospelman. My secular comics can be found at www.MiloComics.com and Hip Hop at www.EmpireComicsLab.com. This is a Christian comic I conceived back in 2004 or 2005. 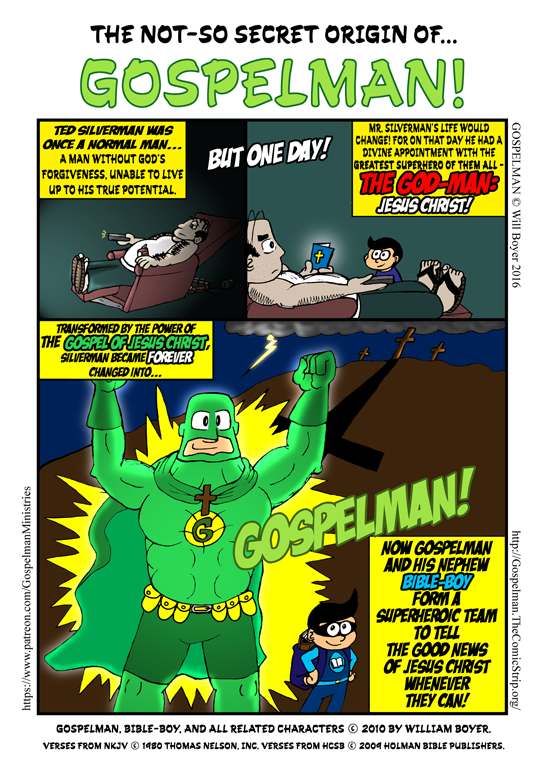 Today's strip, the origin, is more of the basic concept of Gospelman. It is presented in a way that is directed more towards much younger audiences, although my desire is to present the series to a broader range of readers. Christian entertainment is an almost completely untapped market and I have a desire to both teach and entertain in a way that hopefully won't put people to sleep and will not insult their intelligence (something most religious and secular kids' edutainment fails to do). When commenting, due to the controversial feelings and thoughts that politics and religion often bring up, remember to always comment in a mature and professional way. Thank you.